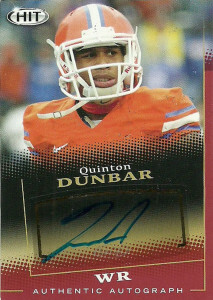 Quinton Dunbar played his college ball at Florida. While with the Gators he had 111 receptions for 1500 yards and 8 TDs. He didn’t attract much attention in the 2015 draft, Dunbar signed with the Washington Redskins as a free agent. He made it all the way through camp but was released during final cutdowns. The team brought him back immediately and placed him on the practice squad. The Redskins were thin at cornerback so they brought Quinton up to speed and and dropped him in the lineup. He got in some playtime near the end of the season, and recorded his first interception in late November. Dunbar finished his 2015 season with 14 tackles, 5 pass deflections, and an interception. It appears that the Redskins feel they’ve landed quite an athlete in Dunbar, evidenced by his 2016 performance. In week 3 against the New York Giants, Dunbar intercepted his first pass, and then later caught a 31 yard pass on a fake punt. He finished the season with a respectable 39 tackles, 10 pass deflections, and 2 interceptions.